One of my favorite Bluetooth earphones of all time is Plantronics' Backbeat GO 2. Ever since I got it over a year ago, you'd rarely find me outside of home or work without seeing it around my neck. It accompanies me on my walks, my shopping, and most of my daily activities. It is small and minimalistic, easily fits in my purse, and lightly hangs around my neck when not in use. It's also quite comfortable to wear for 2 or 3 hours continuously, enough to entertain me on all of my outings. 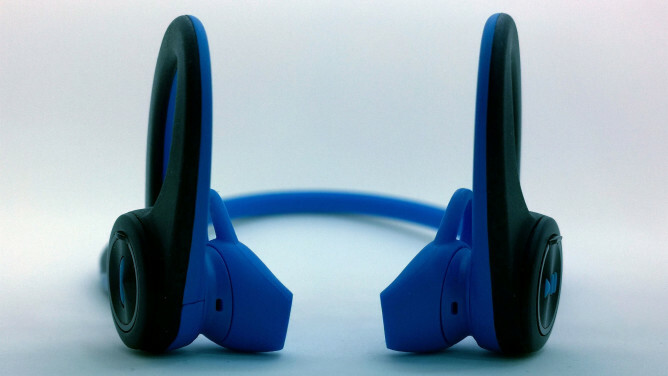 The one problem with the Backbeat GO 2 is its fit, especially when engaged in more energetic activities like running. While the weight and size of the earbuds is counter-balanced by the provided ear stabilizers under regular circumstances, they can become overbearing the moment you start sweating and moving faster or more intensely. The GO 2 would simply not hold in my ears during a run so for the past year, I resorted to wired in-ear earphones while exercising. But luckily, I didn't have to wait long to get the portability and wire-free benefits of the GO 2 along with the fit and stability of in-ear earphones in one perfect unit. 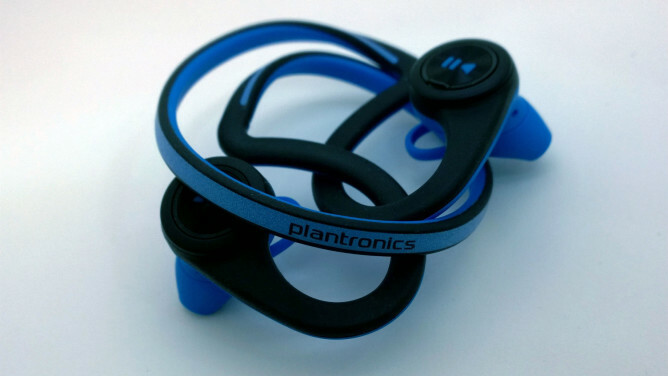 That's the Plantronics Backbeat Fit, a headset I've been using — and loving — during my workouts. I wasn't expecting to like the Fit as much as I do. I'd never subscribed to the idea of dedicated sports headphones — they all felt cheap, looked flashy, and seemed single-purpose. But everything from the Fit's design to its materials makes it feel sporty yet premium, so you'd know your money didn't get wasted on a cheap and flimsy product. 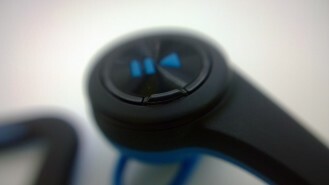 The Fit follows the famous around-the-head design that many sports headsets (like the Motorola S9, S10, and S11) use. However, it adds a lot of improvements to the concept. It is lighter than any of the headsets in Motorola's series, the neck strap is slim and flexible, it won't tug your head back or rub on clothes or hair annoyingly, the battery life is rather impressive for such a small unit, and it doesn't technically use an in-ear design but still balances comfort, sound quality, and safety. 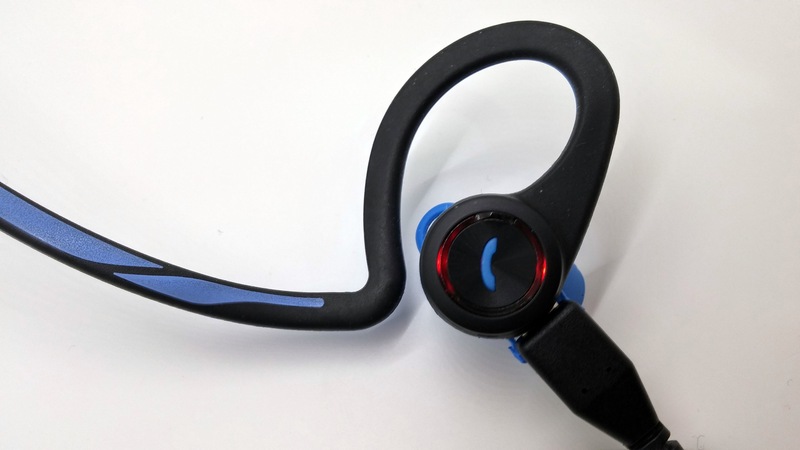 Most of the Backbeat Fit is made from a flexible rubbery material that dons the neck strap, ear tips, and ear stabilizers. The black color is mixed with either blue or green accents that give it an "active" look while also being reflective around the neck band for improved safety during outdoor night exercises. The blue model that I have is bright and spiffy without being too flashy. 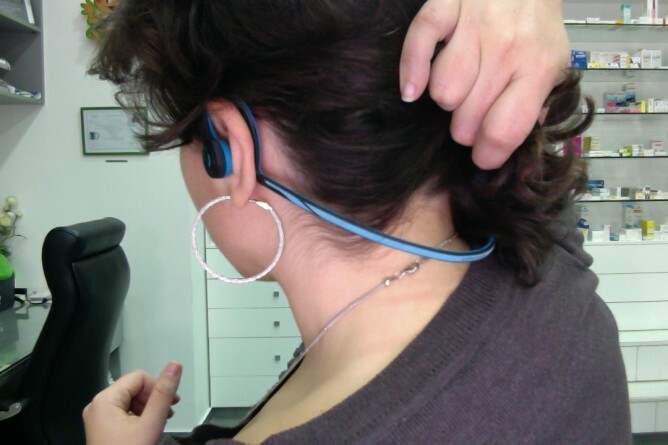 There are 3 important components that work in unison to provide the headset's stability. 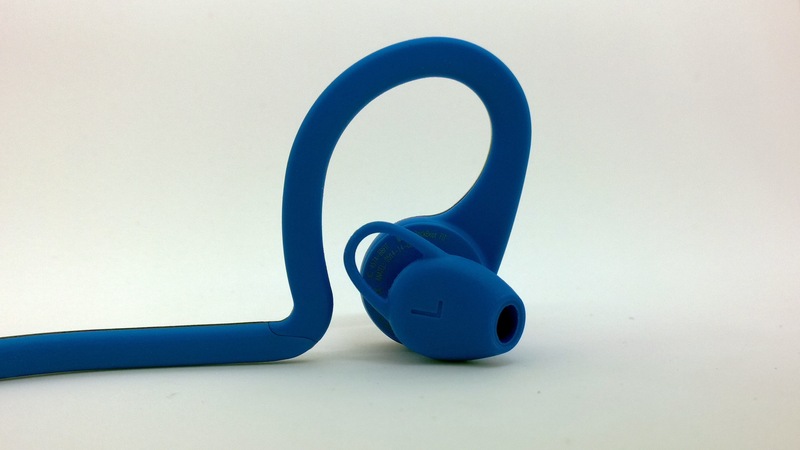 The ear tip is a canal-shaped conduit that sits somewhere in the middle between in-ear and regular earphones. It doesn't exactly have the small tip that goes deep into your ear, but it is angled so that it goes slightly further than usual and directs the sound directly into the ear. This design choice is why the Fit lets you enjoy your chosen audio while simultaneously keeping you aware of your surroundings. On the opposite side of the tip is a small loop that acts as a counter stabilizer. You hook it inside your ear on the cartilage facing your canal. 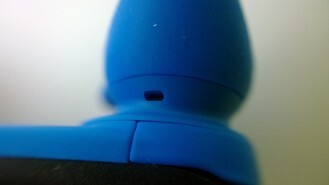 The tip and the small loop are one piece that rotates slightly (about 15 degrees) to accommodate your specific ear type. The final component is the big ear loop, which is more rigid than the neckband but still malleable enough that you can twist it away from the ear module to insert that one freely. 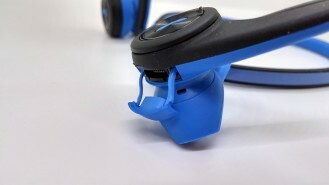 The Backbeat Fit uses 2 similarly sized and designed ear modules with one difference: the right ear houses a meticulously hidden MicroUSB port for charging the headset. Both have a microphone hole on the side that's closer to your mouth. 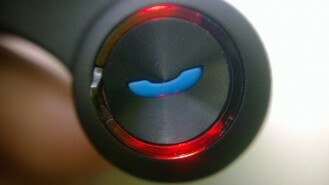 And both carry two buttons: a larger round one with a LED indicator around it and a tiny raised button right above it. The tactile difference between these two is very notable so you'll never find yourself clicking one instead of the other. The right ear is the main unit: this is where you power the headset on/off (the small button) and where you take and end calls (the large one). 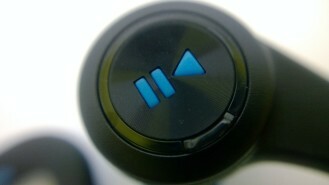 The left ear is where you control the audio, with a Volume Up button (small) and a Play/Pause control (large). There are no dedicated buttons for lowering the volume or skipping tracks, instead you press and hold Volume Up to decrease the level and you double tap Play to skip forward. This results in a few mishaps the first times you try to use the headset. There's no fine-grain control over how many steps you lowered the volume, you just have to figure it out as you're holding the button and let go when you feel you reached the level you want. As for skipping tracks, I found myself pausing and resuming playback instead, until I mastered the exact speed at which the button should be double-pressed. A small manual included in the box details a few other controls, like muting a call, restarting a track, using voice commands, and entering pairing mode (when the headset is off, you press and hold the power button). Unfortunately, you can't connect the Fit to 2 different devices, there's no multi-point support. 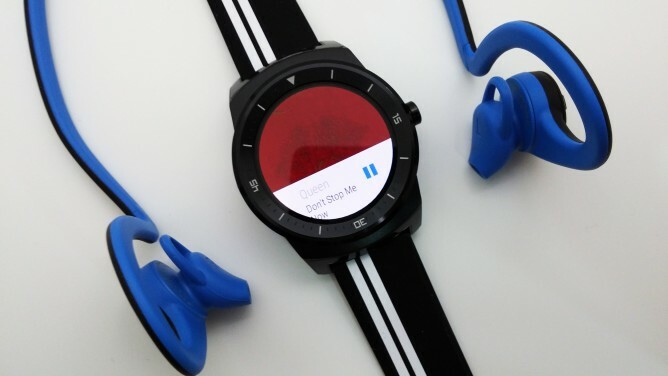 So if you want to listen to the music on your Android Wear watch, you'll have to unpair it from your phone. The LEDs light up in feedback to most of your actions, but since you have the headset on, you won't be seeing them. 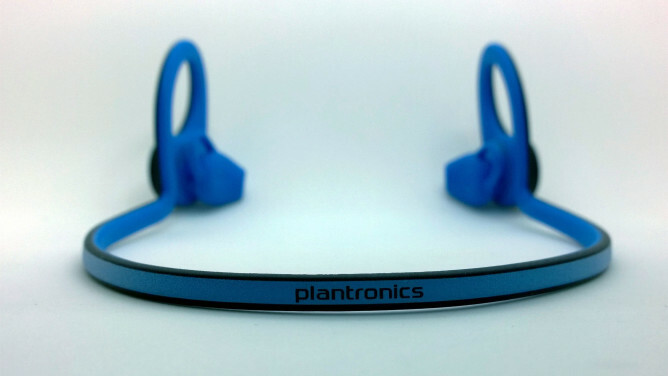 As a workaround, Plantronics uses the same audio feedback that it had on the Backbeat GO 2. A nice female voice will provide you with certain cues like, "Power on," "Battery level medium," "Headphones connected," "Pairing," "Recharge headset," and more. 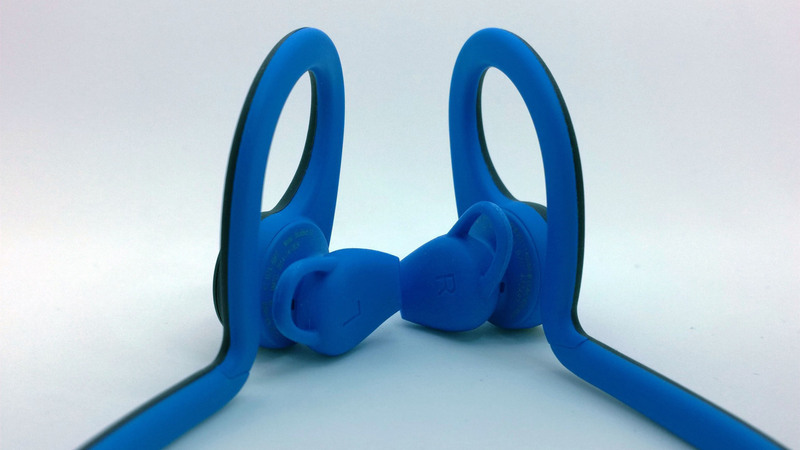 The aspects of a sports headset that you can't compromise on is how well it fits, if it stays in place while you exercise, and how comfortable it is to wear. The Fit, like its name suggests and like my intro revealed, excelled in these areas. I can run an entire hour without having to readjust it once, even when my entire face and neck (and ears) are covered in sweat. As a matter of fact, I still catch myself raising my hand to fiddle with it, a force of habit from all the previous earphones I wore when exercising, only to realize that it doesn't need any adjustment. That said, it took me a while to find the perfect way to put it on. 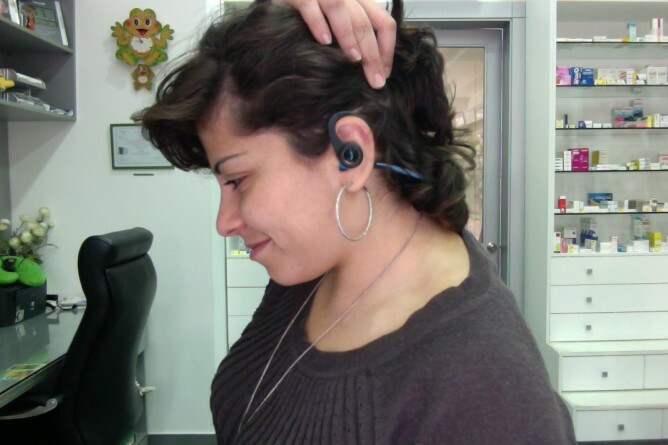 The 3 components that help keep the ear module stable are also the reason why it still takes me a good 4-5 seconds to wear the Fit. It used to be even slower, but I found out that I have to start with the ear tip, then the stabilizer, then get the around-the-ear loop in place. If your first instinct is to get the loop on, you'll struggle to have the rest of the unit in position. But once the headset is in place, there's little that can move it. Bobbing your head while running, shaking it while bending, stretching, or crunching, nothing will faze the Backbeat Fit. Even the size and weight of each ear module (which is still small and extremely light) are inconsequential thanks to the way it is held around and inside your ear. And the neck strap never catches on my clothes or chafes my skin, I simply forget it's there. It almost feels as if it isn't there! For the past few weeks, I've settled on the most minimalistic running gear: the Backbeat Fit connected to my LG G Watch (square first, then I got the R) with an offline playlist of upbeat songs. (I call it Go Go Go.) Thanks to this combo, I don't have a large phone to worry about, I don't have wires that get caught on the treadmill's side rails, I can control playback from my wrist or from the headset (the buttons work well with Play Music on the watch). I feel as light and free as possible to... go go go. Alright, here's the part of the review where I can't go into details. I am really not an audiophile. I don't understand the difference between bass or treble, I don't know what the highs and mids are, and I am completely bewildered by any other music terminology. What I do know is that the Fit sounded as good as any wired headset I have used (I usually go for the Sennheiser CX series). The music is clear, loud enough when you raise the volume, and the beat is palpable when you go for rhythmic songs. However, you can still hear car honks and general noise around you, that's a safety feature of the Fit. These are not noise-canceling earphones. As for voice calls, I was able to hear the other callers clearly and they never noticed that I was talking out of a headset and not directly on the phone. "I'm traveling at the speed of light"
You can check out the Fit's Amazon reviews for more detailed audio thoughts from users who know (or don't) what they are talking about. My general takeaway there was that most people either seemed completely smitten by their quality or found them average but very adequate for a sports headset. Either way, I call it a win. 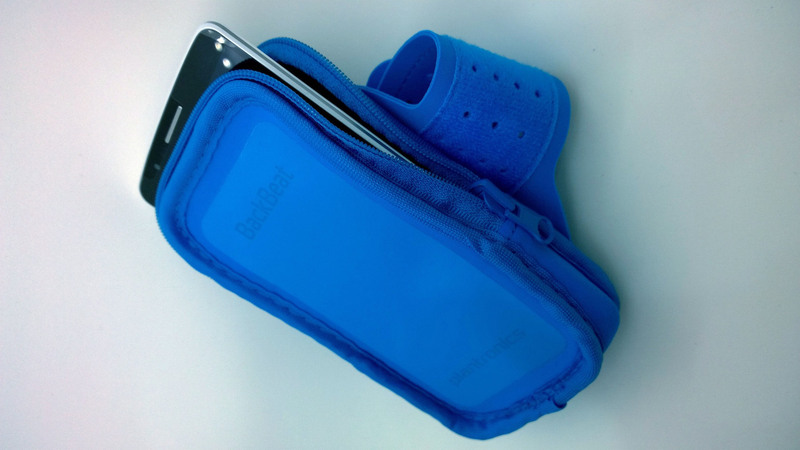 There's a genius part of the Backbeat Fit that I completely hated: the 2-in-1 pouch that ships with it. It's rare to find a pair of headphones that come with a pouch in the box, even rarer for that pouch to actually be very well made. ...Except for the part where I ended up hating it because I couldn't use it. The pouch is rather compact, so it could only fit smaller phones by today's standards. Anything with a screen larger than 5" will have a lot of trouble getting inside the pouch — neither my G2 nor my G3 were compatible with it. 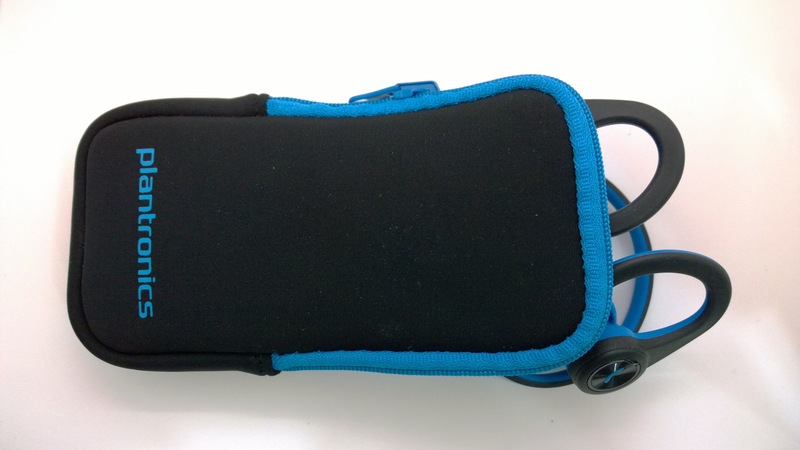 I ended up resenting the pouch because it seemed to be made for the previous iPhone generation and its ilk of teeny tiny smartphones. ARRRRGHHHHH! Why won't you hold my G3, pouch? Plantronics rates the battery life of the Backbeat Fit at 8 hours for music listening and I found that claim to be mostly accurate. I am easily able to get through 7 running sessions of 50 to 60 minutes each before I hear the nice lady that lives inside the Fit ask me to "Recharge Headset." I figure that I could get another session out of them before they shut down, but I don't take the risk so I charge them before my next run. It takes an hour or two to get the battery completely full, but you can thankfully do it anywhere you have a MicroUSB cable. Standby time is rated at 14 days, but the Fit has a smart DeepSleep hibernation mode that kicks in when it's away from the phone, watch, or tablet you have it connected to. Thanks to that, it can last up to 6 months on one charge. I always turn it off when I'm done with my workout, but it's nice to know that should I forget to do it one day, the battery won't run dry while the headset is in the drawer and I'm at work. For more than a few years, I have been looking for the perfect headset for my exercise routine. Every earphone I tried, be it a wired or a Bluetooth one had its shortcomings — wire snags, cumbersome setup, unstable fit, short battery life, and so on. The Backbeat Fit is the first time that I feel that I don't have anything major to complain about. Sure, I would like more controls, an even longer battery life (don't we always want that? 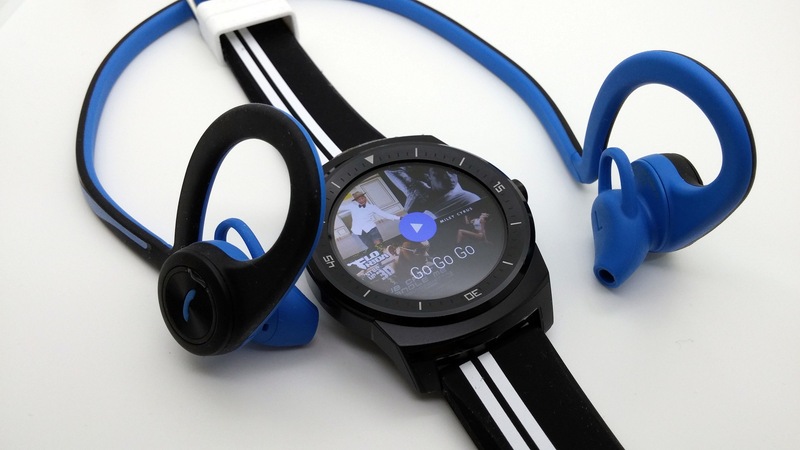 ), and the possibility to connect it to my watch and my phone simultaneously without having to re-pair each time, but those are secondary options when you're looking at a sports headset. In that field, you worry about durability, stability, and comfort more than anything else. The Fit comes out with flying colors in all of that. As a bonus, it's small, lightweight, and looks really cool. That's why I would recommend it to anyone who's searching for an exercise headphone.